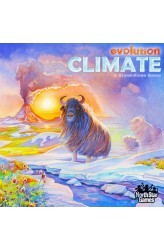 Evolution: Climate is a standalone game that introduces climate into the Evolution game system. In Evolution: Climate, players adapt their species in a dynamic ecosystem where food is scarce, predators lurk, and the climate can swing between scorching hot and icy cold. Traits like a Hard Shell and Horns can protect your species from Carnivores while a Long Neck will help them get food that others cannot reach. Heavy Fur and Migratory can protect your species from the cold while being Nocturnal or Burrowing will provide protection from the cruel desert sun. With over 200,000 ways to evolve your species, every game evolves into a different adventure. 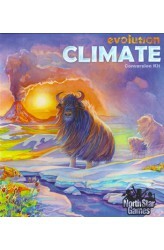 The Climate standalone game dramatically changes game play with several simple additions to the E..
From the box blurb: This conversion kit is designed for players who already own the Evolution base game. It contains everything needed to transform your base game into Evolution Climate. In Evolution, your species must adapt to avoid starvation and fierce predators. Evolution Climate creates an additional challenge: the ever-changing climate. Give your species Heavy Fur to protect them against the bitter Ice Age, or give them Nocturnal to avoid the heat of the cruel desert sun. With amazing new traits and extraordinary new challenges, this conversion kit makes Evolution more diverse, more strategic, and more rewarding. 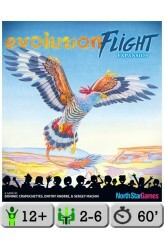 Contents: 86 Trait Cards 30 Event Cards 1 Climate Board 1 Climate Marker 1 Rule Book 2 Player Aids ..
Evolution: Flight, an expansion for Evolution, introduces avian species into the ecosystem. Now your species can swoop on unsuspecting prey from above, fly away from predators, or soar to a new location when food is scarce. Will the ability to fly propel you to new heights? Or will it bring your downfall? Explore the expanding Evolution world and find out! With this expansion, you may now choose between creating a normal species and creating a flying species. Flying species have special costs and advantages: Costs 1. You must discard 2 cards instead of 1 to create a flying species. 2. Flying species have a maximum body size of 3 instead of 6. 3. Flying species have an upkeep cost of food equal to their Body Size. The upkeep cost simulates the amount of food needed to mai..
Bandits! Bluffing! Gunslingers! Nuns with bad habits! 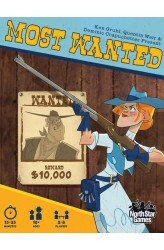 Most Wanted is a western-themed game where fellow bandits compete to become the most notorious outlaw of the land. Playing the best hand - or bluffing with the worst – could mean the difference between a successful train robbery or time spent in the slammer. Players can repent at church to make a new start, or even work some honest labor (gasp!) for bail money. Be the first player to 13 points and claim the dubious honor of being the MOST WANTED. Go get 'em, partner! Most Wanted is a poker-style game that will get your friends bluffing, cheering, and talking in accents. 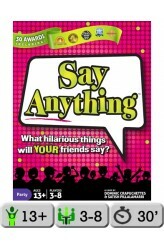 On your turn, choose one of six possible actions: There are three robberies that anyone can participate in, two actions that further your position b..
Say Anything is a light-hearted game about what you and your friends think. It gives you the chance to settle questions that have been hotly debated for centuries. For instance, "What is the most overrated band of all time?" or "Which celebrity would be the most fun to hang out with for a day?" So dig deep into your heart or just come up with something witty - this is your chance to Say Anything! How to Play 1) Ask a question from the card you draw. Ex: - If you could have a "BIG" anything, what would it be? - What's the most important invention of the last century? - Which website would be hardest to live without? - What's the best activity for a first date? - What's the worst thing to say to a cop after getting pulled over? 2) Everyone else writes an answer and thr..
Trivia for People Who Don't Know Stuff! Not a trivia buff? It doesn’t matter! Each player writes a guess to a question such as “In what year did the bikini swimsuit makes its first appearance?” or “How many feet wide is an NFL football field?” and places it face-up on the betting mat. Think you know the answer? Bet on your guess. Think you know who the experts are? Bet on their guess. The closest answer pays out according to the odds on the betting mat. Strike it big and you’ll be cheering like you just hit the jackpot! 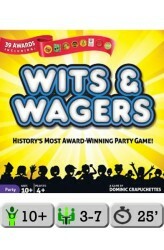 Wits & Wagers is a trivia game that lets you bet on anyone’s answer. So you can win by making educated guesses, by playing the odds, or by knowing the interests of your friends. It can be taught in 2 minutes, played in 25 minutes, and accommodates up to 20 peop..